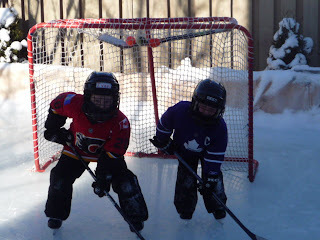 My husband has worked really, really hard the past couple of winters to build an ice rink in our backyard for the boys. It has been amazing and the boys just love it... and their dad! Can't get any more Canadian than this! What a great way to create some memories of your boy's childhoods. Fun - we did not get snow here (Vancouver) at all this year, I think this is the first year in my whole life that has happened. Oh my gosh Lea I'm from a HUGE hockey family! I love this picture! They look like my brother many years ago. I'll probably be banished from your blog, but....Go Wings! Go Hawks! Love it , I grew up near a lake and I always wanted something like that. My dh would be so jealous!!! Living in Hockeytown gives us the Hockey bug bad... Come on WINGS!! They need Canucks jerseys to make it picture perfect. 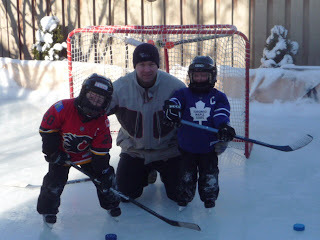 Lol...great tradition, great dad, great Canadian pastime. I love being Canadian. Have not caught the hockey bug but these are very cute. How fun for your family to have that!